All DNA biosensors discussed so far use DNA as the biological recognition probe to obtain specificity. Several novel methods use nonspecific proteins such as ion channels or enzymes to detect sequence information from single molecules of DNA. The most commonly employed ion channel is the a-hemolysin ion channel reconstituted in an artificial bilayer. Using a 120-mV applied potential, the channel samples unlabeled DNA from solution. Capture of a DNA molecule is observed as an ionic current blockade. Blockade durations can last from 20 msec to minutes depending on the length and stability of the molecule. Real-time identification using machine-learning analysis requires up to a 50-msec read of each molecule.1-23-1 Watson-Crick base-pair differences at the termini of 9-bp DNA hairpins were distinguishable using this analysis method. 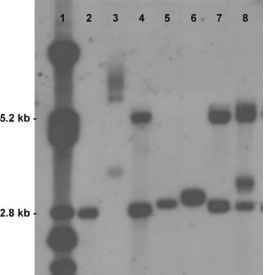 [24,25] Standard experimental conditions were 10-p.M target DNA in 70 pL. A reduction in volume would lower the concentration needed to maintain an adequate acquisition rate. However, identification of comparable sequence information from single-stranded DNA is not possible with the current system. Up to 12 nucleotides contribute to blocking current through the transmembrane compartment at a time, and the translocation rate of 2 msec per nucleotide is at the limit of electronic instrument noise. A nanopore device capable of reading sequence from target DNA will likely incorporate an enzyme that reduces translocation speed from microseconds to milliseconds. Another method to observe DNA, a single nucleotide at a time, used a surface-bound DNA polymerase. Levene and colleagues used a 50-nm-wide well in a metal film as a zero-mode waveguide to restrict excitation light to the immediate vicinity of the enzyme. They observed realtime synthesis of a single DNA polymerase by monitoring the incorporation of fluorophore-labeled dCTP into a growing cDNA strand. If dNTPs with different fluoro-phores on each were used, it would be possible, in principle, to monitor the order of nucleotide incorporation and reconstruct the sequence.